Diane Fingar, one of our Board members, recently was rewarded for years of study and volunteer work with her wildlife rehabilitation license! Dedicated to animals all her life, Diane also focuses on humane education and legislation when not busy in her elementary school classroom. With spring around the corner, it’s likely that many of us will soon encounter young wildlife in our backyard or nearby woods. While always amazing to watch, there may be times when we wonder if that young bird, rabbit, or fawn may be in need of help. Often young animals appear to be struggling, helpless, or even orphaned as we watch them, feeling unsure of whether to step in or let mother nature take its course. However, these young animals are going through an important stage of their development and will have a better chance of surviving if we leave them. There are a few things to remember should you find yourself in that predicament. One of the most common calls to wildlife rehabilitators is from those who have found a young bird on the ground. Often referred to as a fledgling or brancher, these young birds are strengthening their wings and learning the skills necessary for flight. This is normal. Although it may not be apparent, their parents are watching in nearby trees and are anxious for you to move away. If you see a young bird or brancher in your yard, make sure all your pets are kept indoors until the bird has had time to move to safety. If you see a nest nearby, you can carefully place the bird back in it if you are sure that the nest belongs to this bird. It’s a myth that a mother bird will not care for its young if they have been handled by a human. Although it may not be apparent, their parents are watching in nearby trees and are anxious for you to move away. If you see a young bird or brancher in your yard, make sure all your pets are kept indoors until the bird has had time to move to safety. Young rabbits and fawns are also often seen alone in the spring. As with the birds, they are probably not orphaned. Mother rabbits and deer are known to leave their young for hours before returning. Even though they may appear to be out of sight, they are actually nearby. All too often, a wildlife enthusiast will remove young rabbits or fawns thinking they are abandoned. Doing this not only jeopardizes their health, but also risks their chances of survival if not released quickly back into their habitat. 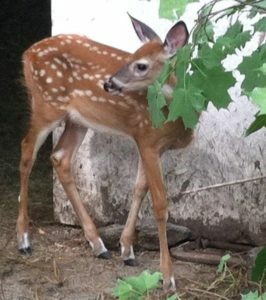 Interestingly, young fawns and rabbits who have been mistakenly removed, and then returned to the same location, even after a few days, have been known to be reunited with their parents. If you do come across an injured and/or orphaned animal, keep in mind that they require a tremendous amount of care. Many need hourly feedings, special cages, continued heat sources, and even medication. For this reason it is always best to contact a wildlife rehabilitator when you find an animal that appears injured and/or requires attention. You can find a list of wildlife rehabilitators located throughout the state on NYSHA’s website. Seeing young wildlife in spring is a thrilling and cherished sight. With an understanding that animal parents do a much better job at raising their young than humans, it’s usually best to let them be while enjoying the beauty of it all.